Mosquitoes use a triple threat of visual, olfactory, and thermal cues to home in on their human targets, a new Caltech study suggests. Are you dousing your skin with bug repellents and lighting citronella candles to keep mosquitoes away? These efforts may keep them at bay for a while, but no solution is perfect because mosquitoes have evolved to use a triple threat of visual, olfactory, and thermal cues to home in on their human targets, a new Caltech study suggests. The study appears in the July 17 online version of the journal Current Biology. When an adult female mosquito needs a blood meal to feed her young, she searches for a host — often a human. Many insects, mosquitoes included, are attracted by the odor of the carbon dioxide (CO2) gas that humans and other animals naturally exhale. However, mosquitoes can also pick up other cues that signal a human is nearby. They use their vision to spot a host and thermal sensory information to detect body heat. Mosquitoes combine this information to map out the path to their next meal. To find out how and when the mosquitoes use each type of sensory information, the researchers released hungry, mated female mosquitoes into a wind tunnel in which different sensory cues could be independently controlled. The researchers injected a high-concentration CO2 plume into the tunnel, mimicking the signal created by the breath of a human. In series of experiments, they found that the insects were attracted by the CO2, which is an indicator of a nearby host, and would also spend a lot of time hovering near high-contrast objects control experiments – think: a person. In another set of experiments, to test thermal factors, the researchers found that mosquitoes are attracted to warmth. Information gathered from all of these experiments enabled the researchers to create a model of how the mosquito finds its host over different distances. They hypothesize that from 10 to 50 meters away, a mosquito smells a host’s CO2 plume. As it flies closer—to within 5 to 15 meters—it begins to see the host. Then, guided by visual cues that draw it even closer, the mosquito can sense the host’s body heat. This occurs at a distance of less than a meter. Our experiments suggest that female mosquitoes do this in a rather elegant way when searching for food. They only pay attention to visual features after they detect an odor that indicates the presence of a host nearby. This helps ensure that they don’t waste their time investigating false targets like rocks and vegetation. Our next challenge is to uncover the circuits in the brain that allow an odor to so profoundly change the way they respond to a visual image. Even if it were possible to hold one’s breath indefinitely, another human breathing nearby, or several meters upwind, would create a CO2 plume that could lead mosquitoes close enough to you that they may lock on to your visual signature. The strongest defense is therefore to become invisible, or at least visually camouflaged. Even in this case, however, mosquitoes could still locate you by tracking the heat signature of your body . . . The independent and iterative nature of the sensory-motor reflexes renders mosquitoes’ host seeking strategy annoyingly robust. Bottom line: According to a Caltech study, mosquitoes use a triple threat of visual, olfactory, and thermal cues to home in on their human targets. 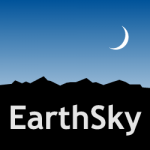 The EarthSky team has a blast bringing you daily updates on your cosmos and world. We love your photos and welcome your news tips. Earth, Space, Human World, Tonight.